Technology built for the trucking industry has traditionally been overlooked and the process of freight planning can be time- consuming, slow, prone to human error with details that have traditionally been relayed using handwritten notes. 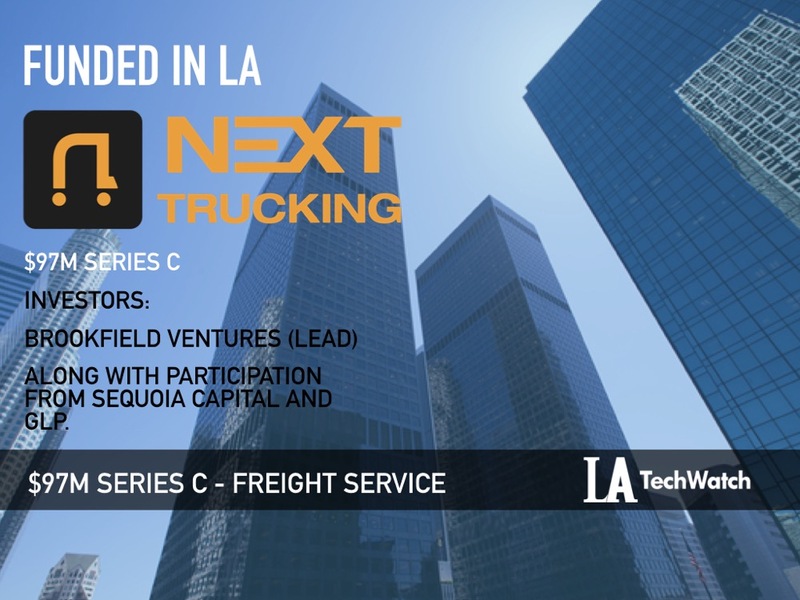 NEXT Trucking has reinvented the way in which shippers and truckers do business, through its technology platform, by managing the details of a shipment to seamlessly offer an on-demand platform that meets shippers’ freight needs. 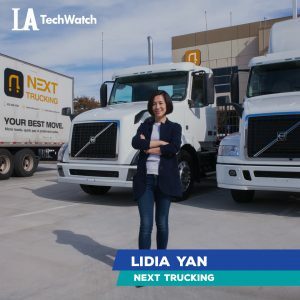 NEXT Trucking also empowers truck drivers by matching them to available jobs, giving them unprecedented control over their own careers similar to that of an Uber driver. The company has taken a manual process and introduced flexibility and transparency, benefitting both shippers and drivers, which has the added benefit of leading to more efficient shipments, which keeps consumers happy. LA TechWatch had the pleasure of catching up with CEO and cofounder Lidia Yan to learn more about the company’s latest funding, NEXT’s future plans and new service launches, and how her role has changed as NEXT has scaled to over $125M in funding over five rounds. Today, we announced our Series C funding of $97M. The round was led by Brookfield Ventures, with participation from Sequoia Capital, GLP, and others, bringing NEXT’s total capital raised to more than $125M. Tell us about your product or service that NEXT offers. NEXT offers the first-ever trucker-centric technology platform that connects shippers and carriers to meet today’s growing transportation demands. With smart matching and predictive load technologies, NEXT matches truck drivers with capacity to available loads, streamlining the process and providing drivers with full control over their careers. With the best talent from both the technology and logistics industries, NEXT is developing innovative solutions to solve today’s biggest transportation challenges. What inspired you to start NEXT? I come from a background in logistics and e-commerce, both in China and the US, and have always had an eye for inefficiencies in marketplaces. On a visit to my family’s business (a traditional 3PL company), I noticed an everyday exchange between a trucker and a warehouse employee that gave me the inspiration for NEXT. A trucker was looking to track down a large shipment with the details handwritten on a sticky note. 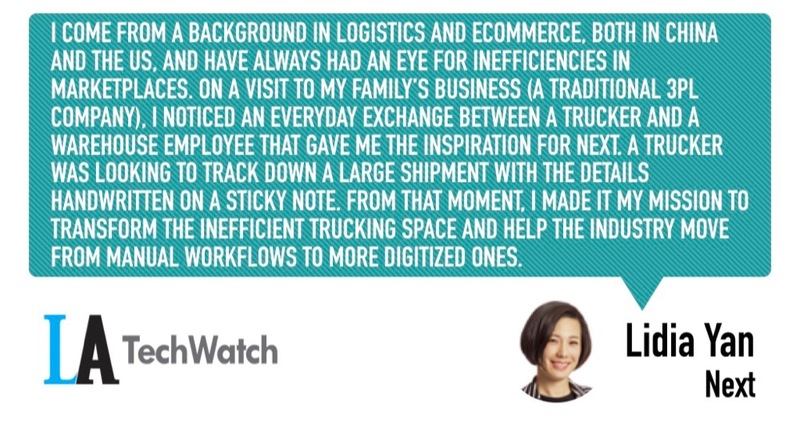 From that moment, I made it my mission to transform the inefficient trucking space and help the industry move from manual workflows to more digitized ones. At NEXT, we have a very deep and nuanced understanding of logistics and the day-to-day pain points of shippers and drivers alike. NEXT is the only driver-centric marketplace – drivers put their preferences in the app including routes, hours and pay, and NEXT’s predictive load matching will surface jobs that fit. NEXT is also the only technology logistics company focused on drayage, with the launch of our new service, Relay. How has your role changed as the company continues to scale from when we previously spoke in 2017 and last year after your previous raises? As NEXT continues to scale, we are hyper-focused on drayage. Nearly two-fifths of logistics costs are spent handling the “last mile,” yet port pickups are still largely inefficient and time consuming for carriers. In order to meet consumer demand, this industry will need to find faster and more cost-efficient ways to get products from ports into consumers’ hands. That is why we’re launching Relay. Relay is our new drayage service, designed to bring efficiency and expanded capacity for the process of moving goods from ports to a shipper’s warehouse. By combining NEXT’s virtual fleet and freight marketplace with owned yards, Relay effectively increases the number of trips that trucks can make to and from port, resulting in faster deliveries for shippers and greater earning potential for drivers. According to the American Trucking Association, trucks move roughly 71% of the nation’s freight, resulting in $738.9B in gross freight revenues (primary shipments only) from trucking. At NEXT, we’re focused on the Port of Long Beach and the Port of Los Angeles, which account for more than 30% of all US imports. Both ports combined account for more than $5B a year in U.S. Customs revenues. The most important mission for us as a company is to be truly trucker-centric -this means providing meaningful solutions for our drivers through a marketplace, technology (our app, algorithms, etc. ), and partnerships. For 2019, we’re hyper-focused on transforming drayage -it’s a pain point for shippers and carriers, and we feel that it’s ready to be revolutionized. It took us two weeks to get our first term sheet and I’m thrilled with the result -I’m confident that the investors that participated in this round are partners beyond the dollars and cents they’re investing; many are active investors in logistics infrastructure and port facilities, including Brookfield Ventures, our lead investor. We hope to leverage their industry expertise and networks as we grow. I think NEXT’s differentiated technology, specifically with our new Relay program, as well as our strong customer base, profitability and proven ability to execute, are all factors that ultimately led investors to really believe in our vision and ultimately provide funding. Additionally, I think our investors see that we truly understand the pain points of carriers and shippers, which is an essential first step towards a promise to help ease these challenges. Hiring is a big priority coming on the heels of our recent Series C funding round. In addition to our Relay program, we plan to use funds from this round to expand our technology, operations, and sales teams and expect to open more than 150 new positions in 2019. The strategy I’ve used to overcome this has been to always be armed with data—hard numbers and facts—which has also forced me to be a more informed decision-maker and a more creative strategist. The best numbers, of course, are growth numbers and our 100 percent YOY revenue growth speaks for itself. The most important lesson we’ve learned is that it’s critical to know your customers’ pain points, and offer a solution that is differentiated in the marketplace. The Relay program was born out of a recognition that a playing in a space that has attracted little attention -drayage- had and has the potential to drastically impact logistics across the country, while making truckers’ lives easier and more rewarding. That focus is what will open up capital opportunities. I see NEXT looking to expand into other areas and open new drayage yards for our Relay program.